Exergames are Cutting Edge Fitness! Climb over it, slide underneath it or work on balance. The Railyard Conditioning Course can do it all. 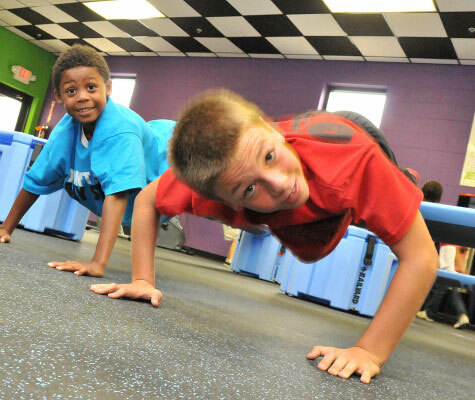 The Railyard Conditioning Course is a portable, easy to use, Obstacle Course that kids from K-12 love to climb, crawl, duck under, and jump on. The exercises that are used on the Course like: Bear Crawl, Alligator, Inch Worm, Stork Walk, and Hop Over’s, provide your students and athletes with strength, cardiovascular conditioning, balance, coordination, agility, flexibility, endurance, and improved posture. Exercise on the Railyard is FUN for children of all fitness levels. They have no idea how hard they work, and to them it’s an indoor playground. The Railyard is quick and easy to set up, will hold over 600 pounds, and can be stored in a small space when not in use. The unique, portable design, allows you to easily transport the Course from school to school or from room to room.